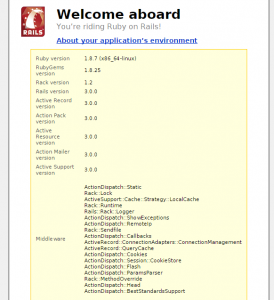 Ruby on Rails is a web application framework built on the Ruby programming language. Older hosting platforms (< v4.5) support up to Rails 2. 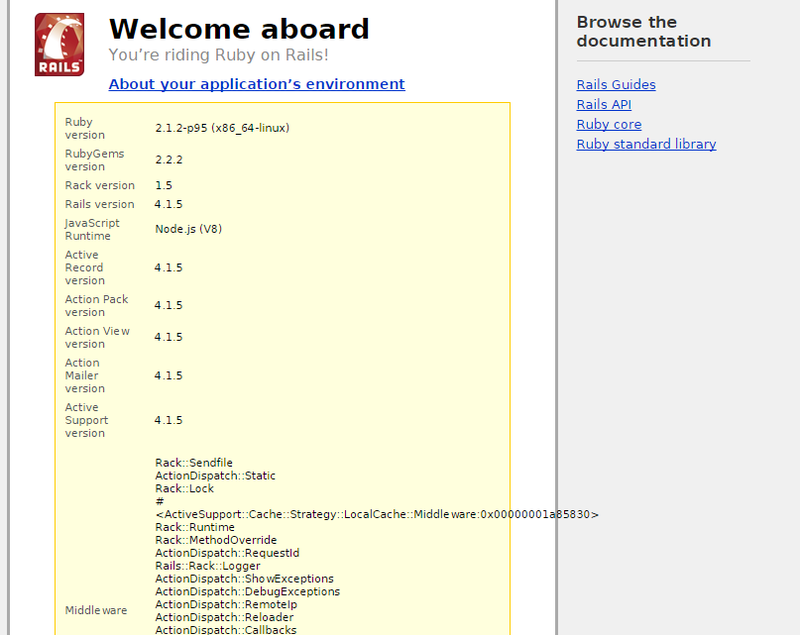 Newer platforms before v6 support Rails 3. v6+ platforms support Rails 2-4+ and Ruby 1.8-2.2+ using rvm. Need a migration to a newer platform to support Rails 4? Just open a ticket in the control panel! This guide only covers platform versions 4.5+. 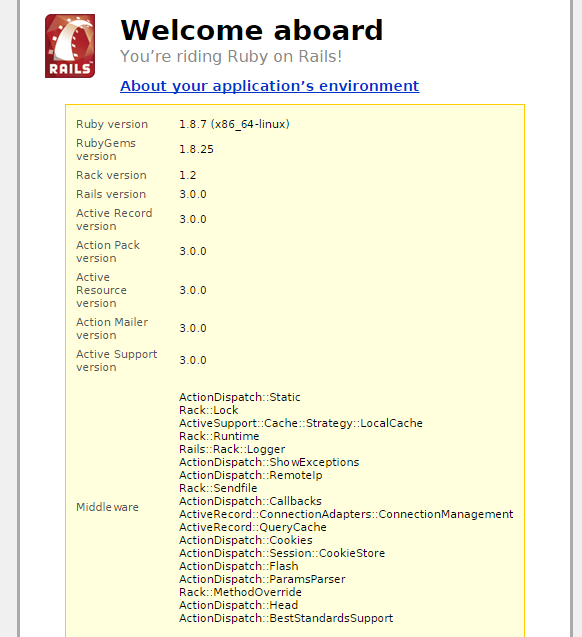 On Sol and newer platforms, you can switch between Ruby versions, and install multiple Rails to suit your requirements. These platforms support Rails versions 2.0 to 4 and beyond. Determine what version of Ruby to use with rvm use. Add that Apache directive to a file called .htaccess located within the public/ directory, /var/www/myapp/public in this case. Adding a Rails subdomain in the CP. Running on an older platform and nestled in your home? No problem! 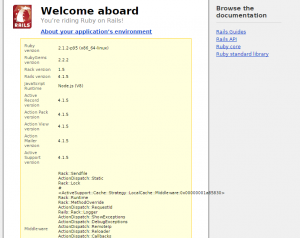 Rails 2 or 3 can be setup using mod_passenger and rubygems. Both are Apache directives added to a file called .htaccess located within the public/ directory, /var/www/myapp/public in this case. For PassengerAppRoot, take the HTTP base path within the control panel under Account > Summary > Web > HTTP Base Path. PassengerAppRoot is the HTTP Base Path + App Path in Terminal, e.g. Add both lines to your .htaccess file. Edit environment.rb in myapp/environments/ to load sqlite3. By default, Rails applications start in production mode, which ratchets down verbosity and runs faster than development mode. During the course of development it may be necessary to change to development mode to facilitate debugging or testing out interim features. To make a change, add SetEnv RAILS_ENV development to your .htaccess file located within the public/ folder of the application. An app may either be restarted upon each request or at a single point. To restart an app every invocation, create a file called always_restart.txt in tmp/: touch tmp/always_restart.txt. To perform a single restart, create a file called restart.txt in tmp/: touch tmp/restart.txt. Passenger, which handles process management, will compare the timestamp with its internal record and restart as necessary. To restart a second time, either reissue the command or delete, then recreate the file to update its modification time. On newer v6 platforms, launcher errors may be viewed through the consolidated log file, /var/log/passenger.log. This entry was posted in Ruby and tagged frameworks, rails, ruby, rvm.